Zoya's Chit Chat collection is really cool. Each of the colors has a fine gold metallic shimmer that makes the color come to life. From the pictures they just seemed flat, but once I saw them in real life I fell in love. Annie. This may be my favorite out of all of them. It's a bright reddish orange with gold shimmer. Really awesome. Elke. Isn't this pretty? It's reddish with gold shimmer, makes it look coral. It shimmers like crazy. Reminds me of Rimmel Play Fast in Out Of Control. Erika. Pale pink with lots of fabulous gold shimmer. Not a color I would wear very often (I'm just not much of a pale pink girl), but you have to love how beautiful it is. Gaia. I LOVE THIS. It's what I wanted Chanel White Satin to be. It's a pure, clean white with gold shimmer. White with depth, definitely! No white-out here. And last but not least, Lianne. Bright orange with gold shimmer. Perfect for summer. I really love how the gold shimmer makes the orange appear to glow. Overall, I really loved this collection. All of them, with the exception of Bekka, applied beautifully. Thin, smooth, beautiful, even coats. The shimmer is what I like the most. It adds interest to the colors and makes you want to keep looking at your sparkling nails! You can get all of these directly from Zoya. Bekka looks kind of blah IMO. But annie and elke are gorgeous! Apart from Bekka, how many coats did they all need to become opaque? Emelie, Bekka isn't what I thought it would be! I thought it was neon green, but it turned out to be sparkly yellow! The rest are gorgeous, though! They only needed 2 coats, except for Gaia which needed three. Tabe-chan, Erika is so pretty in person. The gold shimmer is so beautiful! Jessica, I didn't know that! How cool! I recognized "Elke" but now I have to guess who the others are.... I think Erika could be the Erika from Makeupbag, possibly... Hmmm! You're right, I heard Erika is from makeupbag, and I know that Annie is the Annie of blogdorfgoodman. 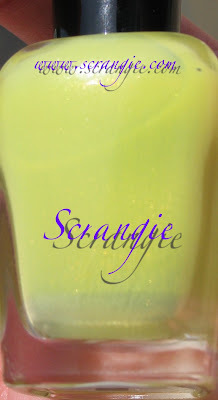 And that is totally how I would picture the Scrangie color.... you've got to franken one! Wow, Annie is lucky to have such a cool color named after her! great colours-Elke is just beautiful! I love the look of Gaia-white is so pretty in the warmer weather. HotPinkHeels, I agree! I'm really starting to get into white, and Gaia might be my new favorite "white plus" (white with a little something extra! ), maybe tied with China Glaze White-kwik-slvr. I've never used Zoya but Erika is soooo pretty. Oooh, great swatches scrangie! I haven't had a chance to swatch this collection yet - wish I had 10hands or more. lol. As most of these colors are nice, I'm totally drawn into Gala. Must be something about finding the perfect white. How is the coverage compared to white satin? I have a theory on what the grey is in the yellow - I've been staring at two bottles of yellow NP I got and noticed they had some greyish looking stuff at the bottom - then when I looked at the polish from different angles I realized it changed how the grey looked slightly and eventually it disappeared - it was the effect of the glass against the nail polish!